I love the Atlanta BeltLine and I’ve been writing about it a lot lately, here and for Coca-Cola. I thought I’d share in a different way a few of the fun facts given by the project’s communications staff, so I put together this little infographic. I included many more numbers in the two articles I wrote about the BeltLine for Coca-Cola’s Journey website. The second part is up now, examining the challenges ahead and highlighting the enthusiasm Atlantans have for the “emerald necklace.” I hope you’ll go there to read it, share it and comment on it. This entry was posted in Atlanta, Business Comms, Entertainment, Social Media and tagged atlanta, beltline, bicycle, bikes, Coke, development, infographic, intern, old fourth ward, run, Running on January 21, 2015 by Jay Croft. Krog Street Market, one of the many intown projects to turn old industrial space into fabulous retail/restaurant developments, is coming along smashingly. Friends had a great dinner Friday at The Luminary, where the bar staff says they’ve been packing in diners for a couple of months. John Tarrant told me Saturday that he and his wife, Cindy, hope to open French Market Flowers next week. Folks at Little Tart coffee and bakeshop said the same thing. I enjoyed a quick walk-through Saturday, where renovations are concluding, and I look forward to Krog Street Market’s success. It’s another exciting addition to the neighborhood. And now I won’t have to drive so far for my Jeni’s Ice Cream fix. This entry was posted in Atlanta, Entertainment and tagged atlanta, beltline, inman park, Krog Street Market, ponce city market, redevelopment, restaurants on November 15, 2014 by Jay Croft. I just got in from a bike ride on the Atlanta BeltLine, where it’s no surprise that everyone loves it. I was curious if people had an opinion about something I heard this week from a top editor at the Atlanta Journal-Constitution: The BeltLine will be bigger for Atlanta than the 1996 Olympics were. I was never a big believer in the scientific veracity of “man on the street” interviews. But they can be fun and, as was the case today, illuminating. 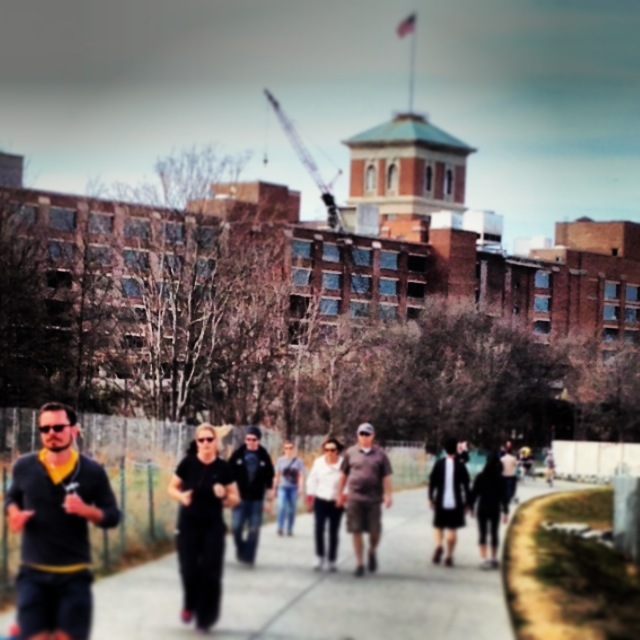 Daniel Keiger is a big fan of the BeltLine and hopes it lives up to its full potential. 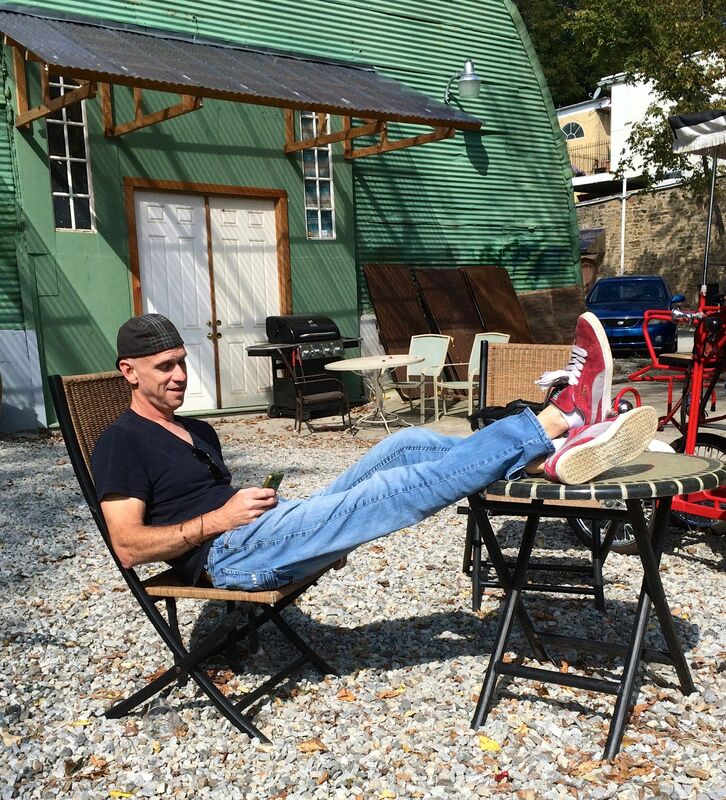 I found Daniel Keiger lounging in the sun outside Atlanta BeltLine Bicycle. He loves the positive, creative energy the trail fosters, and notes that it just keeps building on itself. Like others I spoke to (and the AJC’s senior managing editor Bert Roughton) he said the permanency of the project could mean it indeed will have a great effect on Atlanta. “There’s apartments going up everywhere here,” he said. “Everything leftover from the Olympics is going to be torn down. You know Turner Field is gonna be gone” with the Braves leaving downtown. Trees Atlanta leads a tour group stopping at the bridge over North Avenue. BeltLine culture includes dogs and joggers. Lots of dogs and joggers. A cross fit class ,yoga classes… lots of fitness activities populate the BeltLine. No day in Midtown is complete without hot shirtless guys. The Beltline, one of the country’s most ambitious urban renewal projects, rises above North Avenue here. This entry was posted in Atlanta, Business Comms, Entertainment, Social Media and tagged atlanta, Atlanta BeltLine, beltline, inman park, king of pops, ponce city market on October 11, 2014 by Jay Croft. The Atlanta BeltLine got some free advice from five journalists talking to a roomful of public relations professionals this morning. The BeltLine could become the biggest thing to happen to the city since the 1996 Olympics – bigger than the Games, maybe, since it will be permanent. 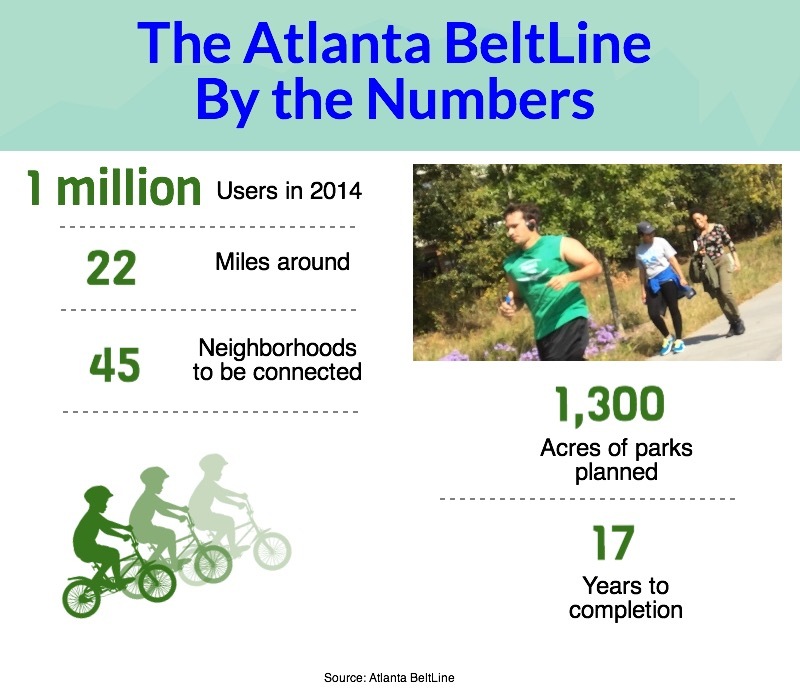 The BeltLine might be too popular (crowded) for its own good. But residents are still going to be worried about security at night. @conorsen Atlanta, with no natural boundaries, is defined by [transportation infrastructure and] commercial real estate. @MaryJaneCredeur Surprised by how many young business professionals say they plan to vote for @carter4governor. -Anita Sharpe, Bloomberg. And here’s The Wilbert Group’s nice SlideShare about the event. Good stuff for anyone interested in news and its coverage in our city. This entry was posted in Atlanta, Business Comms, Social Media and tagged AJC, Anita Sharpe, atlanta, Atlanta BeltLine, Atlanta Journal-Constitution, beltline, Business editor Mark Braykovich, Caroline Wilbert, commercial real estate, news, The Wilbert Group, transportation, Wilbert Group on October 7, 2014 by Jay Croft. Atlanta’s newest attraction. Y’all come. It’s been great to share good thoughts with the Positive Challenge, and I’ll keep up my attitude of gratitude. But today I’m wrapping my seven-day Positive Challenge with a look at three great things about my city, Atlanta. 1. Downtown rocks. 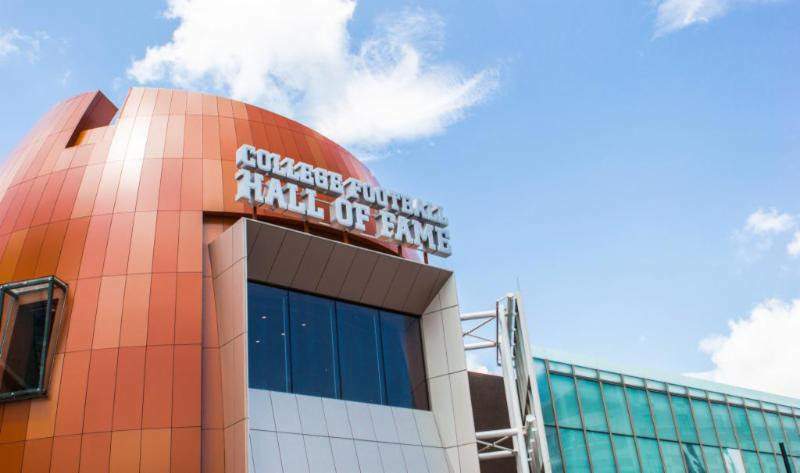 With the newest addition of the College Football Hall of Fame following the Center for Civil and Human Rights by just weeks, we now have a bunch of great reasons for folks to spend all day, or more, downtown. Unheard of just a few years ago, and a boon for residents, tourists, conventioneers, businesses, etc. 2. The BeltLine Corridor. I enjoy starting a bike ride at the Inman Park end of the Atlanta BeltLine, riding past the soon-to-open Ponce City Market, and circling the loop inside Piedmont Park (the city’s crown jewel). 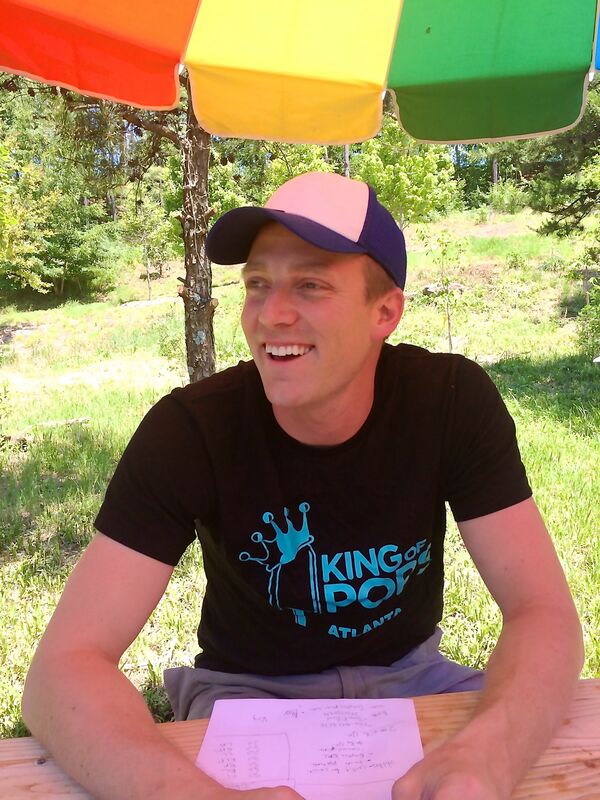 Throw in a popsicle from the King of Pops or some Jake’s Ice Cream, and that’s a great afternoon. 3. Labor Day Weekend. Coming up fast again… Annual favorites DragonCon, the Decatur Book Festival, Black Gay Pride and … what else am I missing? This year, the Braves host the Marlins and the Phillies. And hometown superstar Jennifer Nettles plays Chastain… Who has time to grill? Dang. This entry was posted in Atlanta, Entertainment, Social Media and tagged atlanta, beltline, braves, Center for Civil and Human Rights, College Football Hall of Fame, Decatur Book Festival, downtown, DragonCon, inman park, king of pops, ponce city market on August 25, 2014 by Jay Croft. When Nicole Brodeur does something, I notice. She’s a great journalist, super-smart and one of my favorite friends. 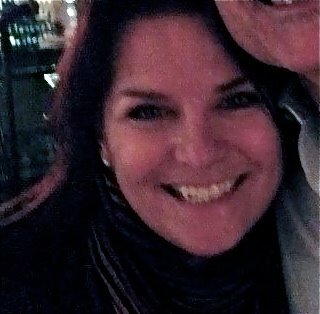 She’s a columnist at The Seattle Times and, if you don’t read her, start now, even if you’re nowhere the Space Needle. 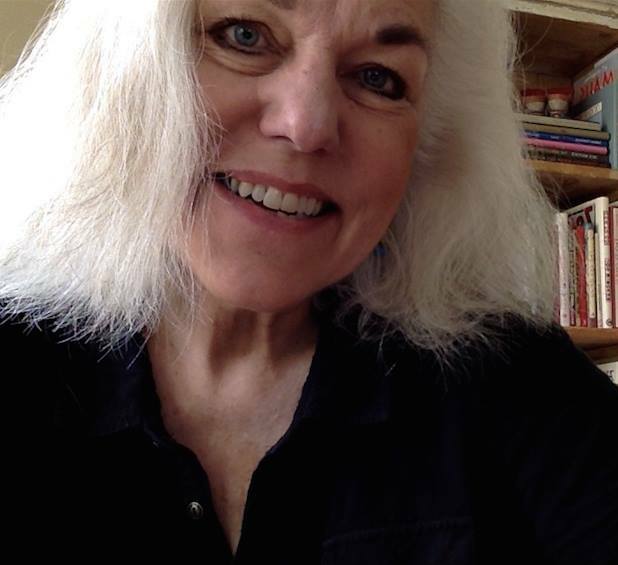 She wrote yesterday about the ALS Ice Bucket Challenge and a former NFL player who has the disease and still participated in the popular social media money- and awareness-raiser. The Positive Challenge was thrown down by Jacqui Banaszynski. I’m not clear on the rules, but I believe that you have to write three positive things about your life, or that happened in your life, every day for a week. And you can tag someone to take over when you’re finished. I’m almost finished, so you start on Monday. Tag, Jay Croft, you’re it! Replied Jacqui: Post three positive thoughts or events each day for seven days. Tag two people a day to do the same. All that is optional, of course. Well, all right. I’ve always found it a good idea to do what smart, beautiful women suggest. So I accepted the challenge. Today is Day Four. I’ll keep updating it on my own Facebook page. What about you? Do you make a point to practice gratitude or positivity every day? Someone once said something like, “Happiness doesn’t bring gratitude — gratitude brings happiness.” I like that. I’m grateful for awesome friends like you. Can I say something as simple as coffee? Because I’m drinking it right now and would be useless without it. The words, the words… always, the words. I was pleased to see new public art on the BeltLine overlooking North Avenue last night on my way home. Today I shared a photo of it here that Atlanta BeltLine put up. Yay. Love public art. Love the Atlanta BeltLine. Love civic improvement and community involvement. I reconnected with an old friend this week. Great to catch up. Hope I can see him again soon. I’m healthy. Everything works. No physical problems. And I’ve been sleeping great the last year, which was not the case for a long time. So: thankful for my health, every day. I love that my job is so close to my house. I can come home for lunch. In fact, I’m home for lunch right now. In the craziness of metro Atlanta traffic, this close proximity is no small blessing. I love cheat days. Not because I love to cheat so much (except for ice cream), but because it’s inevitable that at least one day a week will be chaotic or, yes, tempting, and the cheat-day concept is a nice reminder that it’s OK to be, you know, imperfect. Dadgummit. I’m grateful that today is my friend Tony’s 50th birthday and that my friend John, Tony’s partner, will be celebrating his 60th soon. Because I’d go crazy without them and, you know, I like nice round numbers like 50 and 60… which is why I’m staying 40 forever! Bah-da-bing! 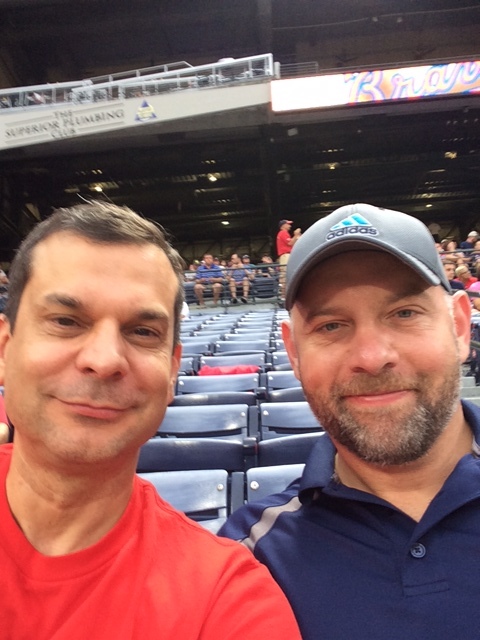 At a Braves game with my buddy Byron Whitt, enjoying Turner Field and its proximity IN THE CITY OF ATLANTA while we still can. 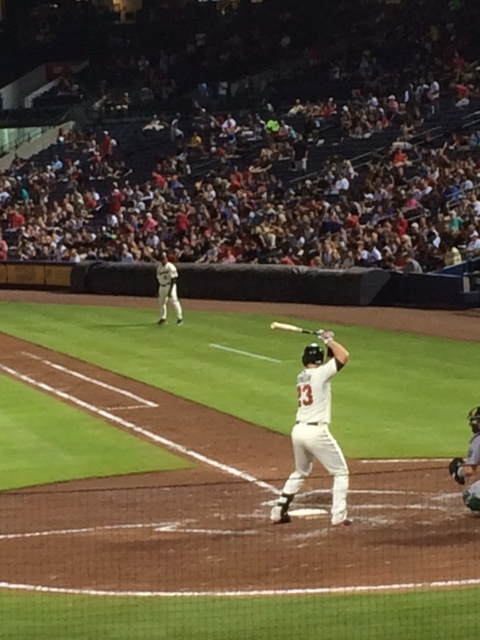 My favorite Brave, Chris Johnson. OK, my baseball BF, right Trish Buswell? Chris, you can email me here on the blog. Or Facebook or Twitter. Or just wave next time you’re at bat, and I’ll know you’re thinking of me. 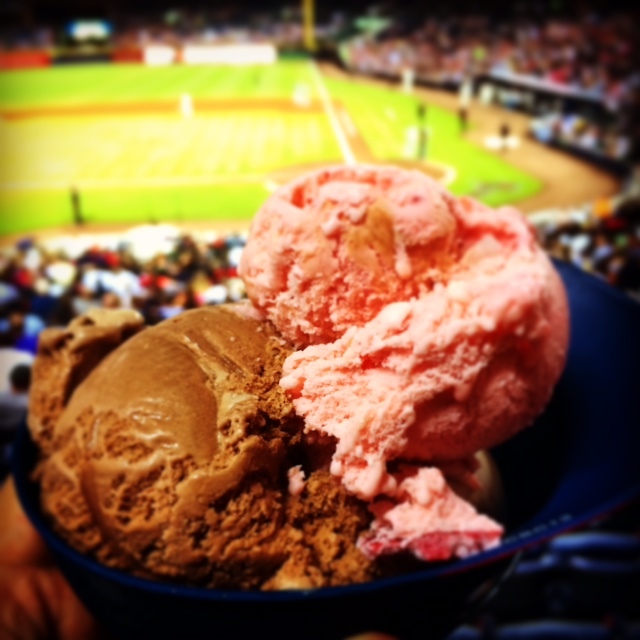 Ice cream + baseball = summertime bliss. This entry was posted in Atlanta, Entertainment, Social Media and tagged ALS Ice-Bucket Challenge, beltline, braves, Chris Johnson, Facebook, Gratitude, Nicole Brodeur, Positive Challenge, Seattle Times, Social Media, Turner Field on August 22, 2014 by Jay Croft. 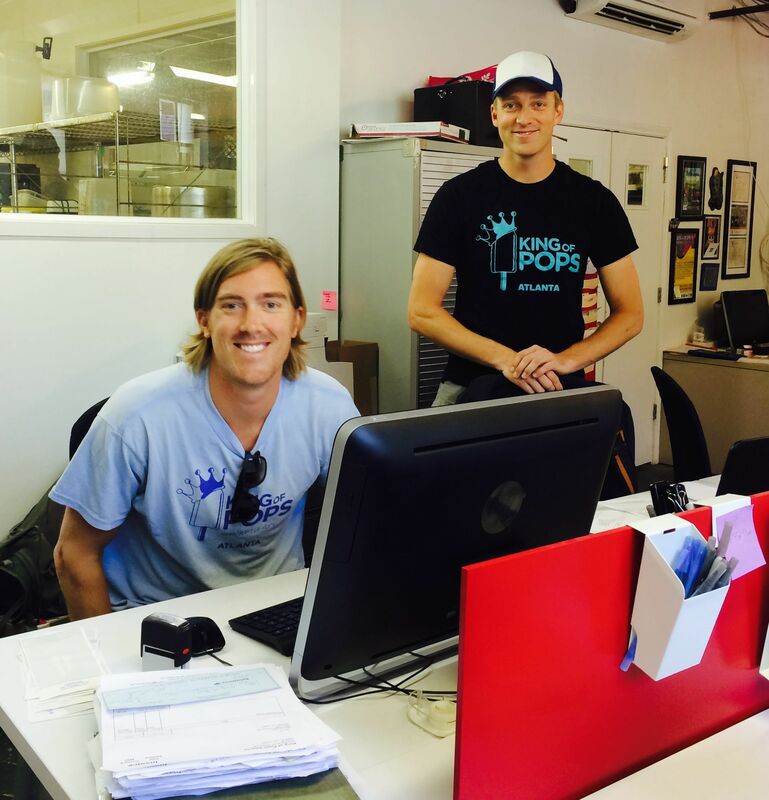 Atlanta’s King of Pops just turned 4, its origin tale almost as familiar around town as it is irresistible. But there’s more to the company’s story since the now-fabled beginning. Here’s a list of 9 things you probably don’t know about or can learn from The King, aka Steven Carse, the laid-off corporate worker who started selling organic, homemade popsicles in fun flavors (chocolate sea salt, Arnold Palmer, mango habanero, apple ginger…) on a street corner in 2010. Since then, brother Nick left his career as an attorney to join the enterprise, and it has become a case study in successful small-business marketing: strong emotional connections; pitch-perfect branding; resonant storytelling; savvy use of social media; and more. And who doesn’t love a popsicle? Since the origin story has been told so often, and is available on the company website, let’s start with some new items. 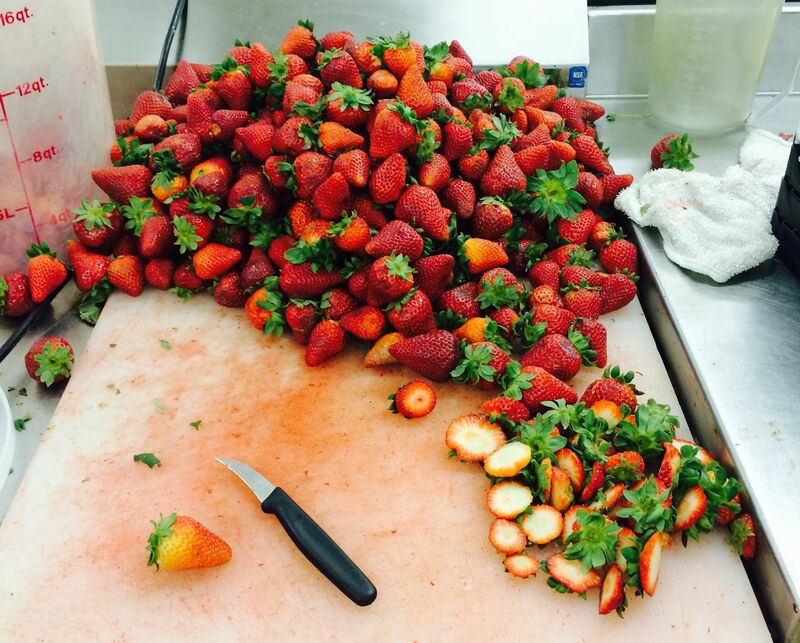 Berry-growing will be a focus of the new farm near Douglasville. Farming Future. The King’s popsicles are made with fresh fruit, herbs, honey and other essentials he soon will grow at a 65-acre farm near Douglasville. Carse plans to use the farm for composting, tours/awareness of farming, and eventually start other food-related businesses. No ‘Shark Tank.’ Carse isn’t looking to sell the business. But every time it’s featured in national media, he gets calls from folks all over who want to open their own King of Pops stand. Growth in the Numbers. In his first year on the corner of Highland and North avenues, Carse estimates he sold 50,000 popsicles, for $2.50 each. The exotic flavors and organic cane sugar/honey/agave sweeteners, along with his low-key pitch, were a hit. This year, he expects to sell 600,000. Value Your Employees. “We attract and hire interesting people,” Carse says. “We get a lot of applicants, people who are musicians or artists or students. Initially, it just worked out that way, but now we like it and look for it.” The company has a dozen full-time employees, plus 30 part-time “slingers” who sell at parks, corners and festivals, based out of a 3,700-square-foot production facility in trendy Inman Park. Stay Focused. They deliver weekly to 50 or 60 locations around the Southeast and plan to keep the regional focus. Most of the retail locations, which include Whole Foods, are around Atlanta. Keep It Real Online. The King of Pops is ideal for social media. Nick Carse says the business makes the most of it by being useful, telling followers where vendors are every day and showing what is available. “Anybody can have social media,” he says, “but it’s gotta be smart.” So linked is the company’s identity with Facebook, Twitter, Tumblr and Pinterest, that he says the King has never spent a dime on advertising. Pops and T-shirts are for sale at the HQ’s window next to the Atlanta Beltline in Inman Park. The pops freeze on their sticks dipped in alcohol. Takes about half an hour. The King of Pops set up shop on my corner at North and Highland a few years ago, under this rainbow umbrella. 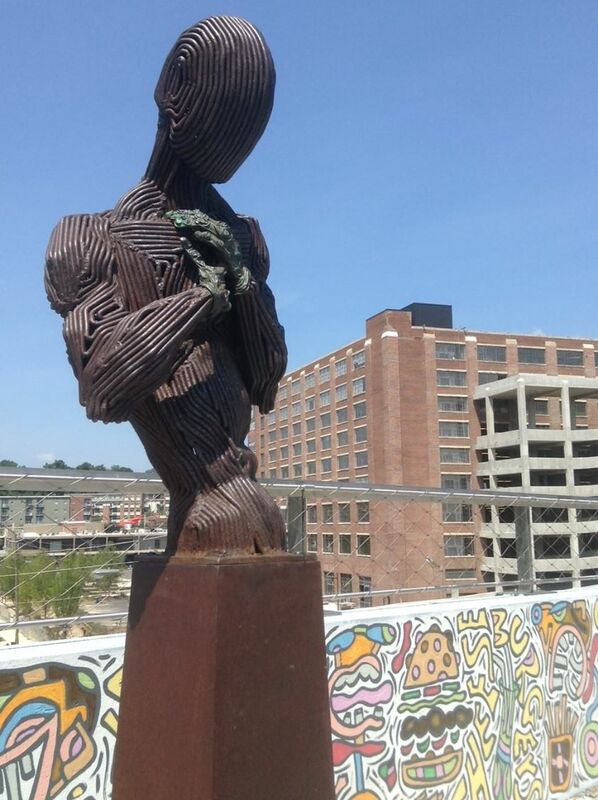 This entry was posted in Atlanta, Business Comms, Social Media and tagged beltline, inman park, king of pops, poncey-highland on May 7, 2014 by Jay Croft. Seems like most of the story about Atlanta’s cool intown projects and events focuses on the Midtown-Inman-Poncey triad. And while there’s a lot going on to justify that, it’s nice when other areas if the city feel some of the love, too. 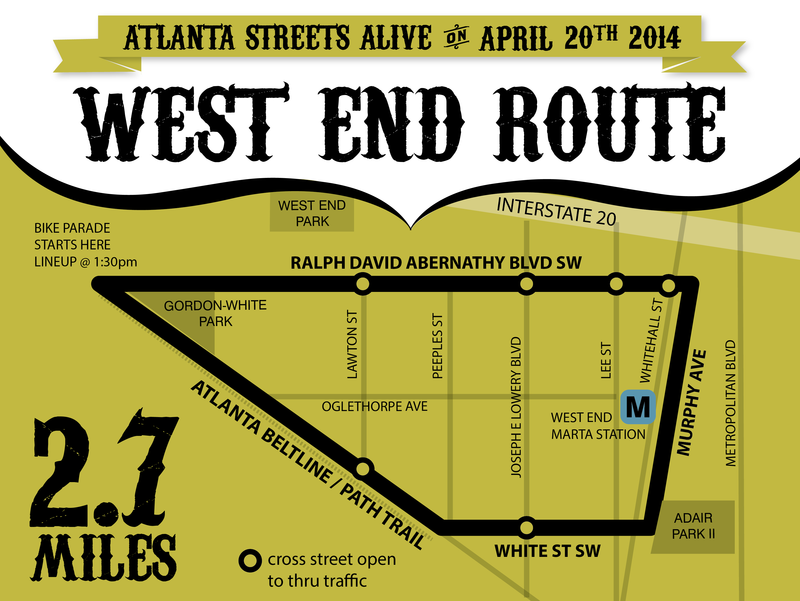 So bravo to Atlanta Streets Alive for heading to West End this Sunday for one of the group’s fun and inspiring community events. Streets Alive will close to automobiles 2.7 miles of road in the heart of West End from 2-6 p.m. to encourage folks to walk and ride bicycles in the area. You can read see more about activities, parking and plans for the day on the Streets Alive website. We sure need more of that in our city. And previous Streets Alive events have been a blast, including one in my Poncey-Highland neighborhood a couple of years ago, with food trucks, lots of families and pets, and community groups sharing their information. Plus who in Atlanta isn’t looking for a good reason to just get out of the car? The event this Sunday, which is Easter, of course, is organized by the Atlanta Bicycle Coalition in partnership with City Council President Ceasar Mitchell and the West End Neighborhood Association. Churches are sharing their parking lots after services. The vision of Atlanta Streets Alive is to encourage Atlanta to develop living streets — streets that appeal to pedestrians, bikers, businesses and neighbors. Streets are publicly owned assets but on most days are used mainly by cars. On this day, people can regain ownership of the streets they pay taxes to build and maintain — and transform them into crazy fun healthy, living streets for all to enjoy. This entry was posted in Atlanta and tagged Atlanta Streets Alive, beltline, bicycle, bikes, walk, West End on April 15, 2014 by Jay Croft.